The modern Le Jardin hotel is an exclusive and superbly designed hotel located right on the beach in Kiris.The resort centre Kemer is just over 6 km away and easy reached by local dolmus. 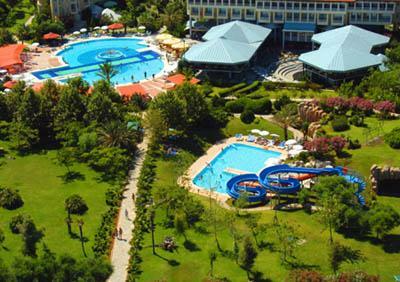 Tennis courts * Turkish bath * sauna * table tennis * darts * billiard * fitness centre * aerobic * entertainment programmes * beach voleyball * diving school * tennis school. 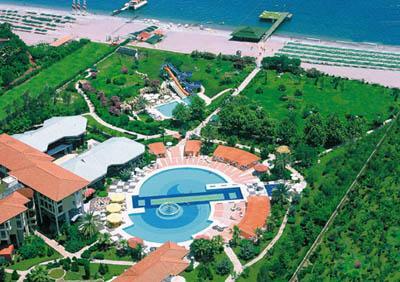 Massage * tennis courts lightning & rackets and balls * water sports * diving center *internet * beauty center. Bathroom (WC + bathtub or shower + hairdryer) * central air-conditioning * satellite TV * telephone * safety deposit box (free of charge) * minibar * carpet * private balcony/terrace. Hotel is situated right on the beach (mixture of rough sand and pubbles). Sunbeds and umbrellas free of charge. Breakfast,lunch and dinner in open buffet,Late breakfast.